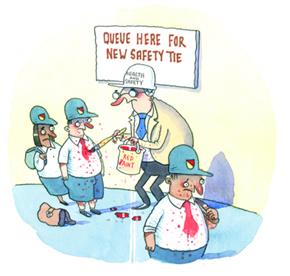 The reality Quite rightly, few parents would see wearing school ties as a safety issue. After all, millions of kids have been wearing ties for years without any real problems. Taking simple precautions during laboratory work or around machinery makes sense. But if the concern is about kids fighting, although clip-on ties may help, the real issue is discipline. So no, we don't ban school ties – it's down to the school to make decisions about uniform, not HSE.